On Sunday, February 5, 2017, Pastor Joe Troutman preached “Instensive Trials” from Job 2:1-10. Jesus Christ at every point of his earthly life blessed God and still died so all who cursed God and believe in his Son will never die. 1. Skin for Skin—Though Job was faithful, he was treated as one who had abandoned the Lord. Our suffering for the sake of Christ points back to the suffering of Jesus himself. 2. Six Little Words—Three Hebrew words echo Job’s faithfulness; three echo the curse. Wife holds our his two choices: to bless God or curse him. As Joshua’s call to choose whom you will serve, Job’s response shows he makes the better choice. 3. The Good with the Bad—In Christ, the justified believer is viewed by God as one who has faithfully endured trials . CLICK TO LISTEN to “Intensive Trials” (Job 2:1-10) at mcopc.org. On Sunday, January 15, 2017, Pastor Joe Troutman preached “Imputation of Wrong Motives” from Job 1:6-12. Salvation is not an external blessing which we have caused and that we can be stripped of, but is an internal God-given gift that can never be taken away. 2. 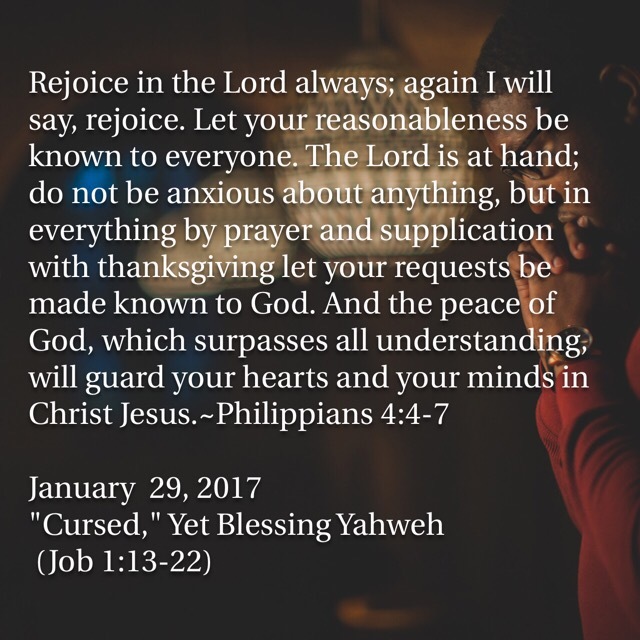 Satan’s Accusation—Satan presumes Job’s fear of God is tied to God’s blessing and protection of Job, the lack of which would provoke Job to lose his fear of God. 3. God’s Good Government—Since Job’s faith comes from God, Satan’s God-allowed test of Job is equally a test of God’s government of his creatures. In trial don’t claim God doesn’t love you. If Job’s faith was found true, so will that of God’s people. CLICK HERE TO LISTEN to “Imputation of Wrong Motives” (Job 1:6-12) at mcopc.org. On Sunday, December 18, 2016, Pastor Joe Troutman preached “A Long-Awaited Son” from Ruth 4:13-22. God oversees suffering to carry out his great plan of salvation. 1. The Birth of a Son—A son was needed to preserve the family name. 2. A Blessing to Naomi (vs. 14-16)—Trust in the Lord, he will provide. 3. A Bigger Picture (vs. 17-22)—The providence of God works through generations to prepare the way for his great work of redemption through Christ, the Son of God. CLICK HERE TO LISTEN to “A Long-Awaited Son” (Ruth 4:13-22) at mcopc.org. On Sunday, December 11, 2016, Pastor Joe Troutman preached “A Testimony True” from John 21:20-25. Whoever trusts that Jesus Christ is Life Incarnate will have life in his name. 1. What About Him?—Who are we to complain about God’s dealings with his people? 2. A True But Partial Testimony—The Jesus of whom John writes is the Word who created all things and dwelt among us. CLICK HERE TO LISTEN to “A Testimony True” (John 21:20-25) at mcopc.org. On Sunday, November 6, 2016, Rev. Joe Troutman preached “The King Fisher” from John 21:1-6, 8-11. As a net draws fish from the sea, so God uses the proclamation of the gospel to draw sinners to Jesus Christ. 1. The Revelation of Jesus Christ—All revelation brings glory to God’s name and sinners to repentance. 2. Cast the Net—The church is to cast the net as her Lord commands, and totrust him for the results. 3. Feeding His Sheep—God has chosen to use the church as the ordinary means by which he calls sinners to faith. The faith of the church is built up by the preaching of the word and the administration of the sacraments. CLICK HERE TO LISTEN to “The King Fisher” (John 21:1-6,8-11) at mcopc.org.